Fun sock monkey tee shirt range. Long and short sleeved toddler t shirts and organic t shirts. Long and short sleeve body suits, baby hats, bibs and baby blankets. Organic apparel is available in select items only. Silly sock monkeys are everywhere, even on our children. Dress you little ones in cheeky monkey clothing. Wearing monkeys is easy when there is such a variety of clothing and accessories to chose from. 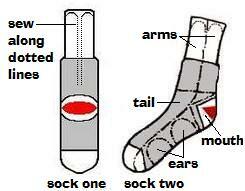 Here are some fun sock monkey things so look at, if you have the time swing on over and take a look. It can be addictive searching for monkey things as there are literally hundreds of interesting monkey things out there to buy. I'll tell you more about that at the bottom of this page. Funky toddler t shirts are 100% cotton. 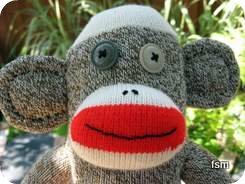 Sock monkey tee shirt colors can be baby blue, white, pink, ash grey, navy, black, red, royal blue and daffodil yellow. Long and short sleeved body suits, onesies or creepers are made with 100% cotton and covered in modern and vintage looking sock monkeys. Select body suits are available in 100% organic cotton. Easy-wash infant bibs can be ordered with trim in either, sky blue, petal pink, kiwi, or cloud white. Bibs are made of 100% cotton and come in one size, fits newborns - 36 months. Long sleeve baby tees, super soft and available in many colors, sizing for 0 - 24 months. <Organic baby t-shirts, you can feel safe putting soft organic cotton tees next to your baby's skin. Free from pesticides and other harmful chemicals, earth friendly baby t-shirts are made from 100% certified organic cotton. Four sizes to fit 3 - 24 months. Sock monkey baby blankets, 37 x 37 (with 1/2" trim), made with super soft cotton. Sock monkey baby hats, one size, available in petal pink, sky blue, kiwi and cloud white. 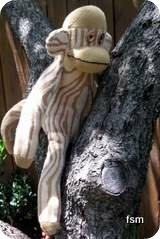 Swing to Funky-Sock-Monkeys online store to have a gander. Older children's clothing: tees, hoodies, sweaters, baseball jerseys.